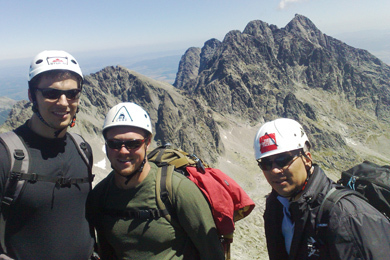 Ladovy (Ice) Peak is "only" the 3rd highest mountain in Slovakia and Tatras, however, it is the tallest in the main High Tatras ridge. The ascent is very attractive as it goes up an exposed ridge via Ladovy Kon (Ice Horse). 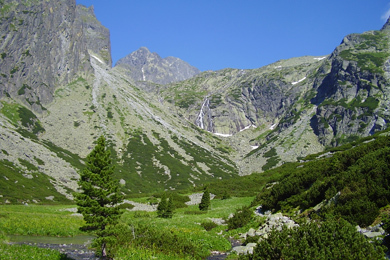 Thanks to its prominence when seen from the north Polish people used to believe it was the highest peak in Tatras. Traditionally, the ascent with a mountain guide begins at Tery Hut leads up the higher parts of Mala Studena Valley. Then it continues on an exposed ridge over Ladovy Kon to the summit. There are amazing views from the top, mainly towards Lomnicky Peak, Javorovy Peaks, Javorova Valley, and Belianske Tatras as well. 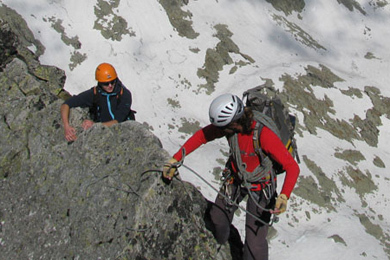 It is possible to climb Ladovy Peak via less difficult routes, however, always only with a mountain guide. The name of this peak (Ice Peak) comes from a small valley on its north side that is notoriously hard to access due it frozen snow that remains there even over couple of years. To gold-diggers, Ladovy Peak represented a “keeper” that guarded an old treasure, however, no one was ever able to find it. Ladovy Peak was first climbed from Javorova Valley by a British alpinist John Ball, Wilhelm Richter, and an uknown mountain guide in August 1843. The first winter ascent was realized by Teodor Wundt and Jakub Horvay on December 25th, 1891.